There's not much middle ground to crossovers as they are usually either depressingly awful or brilliantly cool. On one side you've got frumpy FWD tall wagons, which have zero off-road capabilities yet manage to be crappy on-road as well. Then on the other side you've got true dual-purpose vehicles, able to impress on a winding tarmac backroad or a lumpy dirt trail. So while some may be duped into thinking a Jeep Compass is the best of both worlds, we'd much prefer this, the Mega Track. It's a supercar that can do whatever it wants to, wherever it wants to. Built by the French Aixam Group in the mid '90s, only five examples were created. So was it another underpowered French surrender-monkey? Um, no. The Track had mega power in the form of a 6.0-liter Mercedes-Benz V12 pumping out about 400 HP, and it was mounted right in the middle of the car for classic supercar weight distribution. But how can all this be any good off-road? Well, the standard ride height of 8" was much more than most speed bump-scraping supercars to begin with, but if you wanted more you could just dial it up to 13". 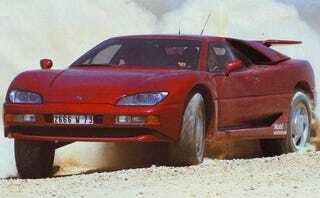 That sort of ground clearance combined with four-wheel-drive meant the Mega Track was able to provide high-speed thrills just about anywhere.